The holidays can put us all on toy overload. But after being cooped up all Winter, playing with all the same toys, it's nice to breathe some new life into the ol' toy collection. Luckily, Hasbro releases new toy s all year long, and this Spring they have introduced some fantastic options for kids of all ages! I had a chance to read about some of the new items and even try a few out myself! 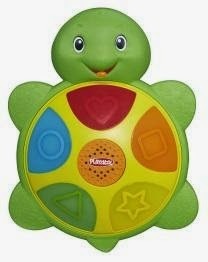 For the littlest of toy lovers, Playskool introduces the SHAPES ‘N COLORS TURTLE. This toy is awesome for little kids because it is interaction. Touch Mr. Turtle, and he will wobble, light up and speak learning phrases. Learn new songs and work on hand-eye coordination all at the same time! I'm all OVER this for my baby niece! Did you know Playskool has a product line called Playskool Heroes? These toys are based off of Transformers and Marvel characters, and designed to let younger kids get in on big kid play action! The TRANSFORMERS RESCUE BOTS take classic robots and turn them into magnificent vehicles. 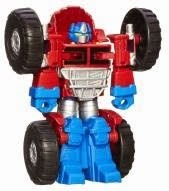 Optimus Prime turn into a rescue monster truck. Bumblebee Bot turns into a motorcycle, and Heatwave robot turns into fire-boat rescue. Thinking my almost 2-year old nephew will enjoy playing like a Big Boy with Playskool Heroes! Jump into the world of Blythe Baxter, a little Downtown City girl living above The Littlest Pet Shop! Kids can enjoy big adventures with these cute little animals and their playsets. 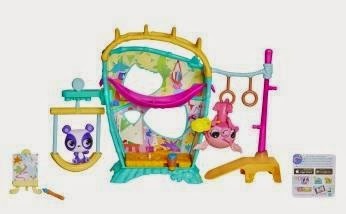 My girls LOVED getting a chance to check out the Littleest Pet Shop Magic Motion Mini Playset. Play with Blythe's monkey, Minka Mark. Minka can paint in her studio, sleep in her hammock and play on her monkey bars and swing set! When she gets hungry, feed her a banana snack. My girls spent hours setting up elaborate tableaus with Minka Mark, marveling that she really closed her eyes for a nap! There is nothing better than the loyal companionship of a pet. 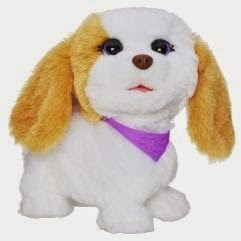 FurReal Friends are the toy pet best friends that love you back! These new fun toys from FurReal Friends are interactive, to the delight of "pet owner" kids. Stroke the back of My Bouncin' Kitty, and she jumps and meows in response. My Bouncin' Pup yips and runs circles when he gets a pat. We are a big allergy family, and right now real pets aren't an option. FurReal Friends are a great option for those who have to be pet-less families! Now that being outdoors is a daily occurrence (can we say THANK GOODNESS Winter is over?! ), there is no better way to enjoy the yard or park than with Nerf toys! This is a brand I loved as a kid. 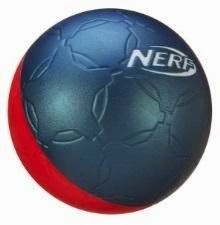 Even though my family was all girls, we loved throwing around Nerf footballs and frisbees. We even owned a couple of Nerf guns! It speaks volumes that Nerf is still a go-to toy brand for today's kids. And they have some AWESOME toys out this Spring! The Nerf N-Sports Soccer Ball is made of foam so it's easy to kick for your up-and-coming soccer stars. 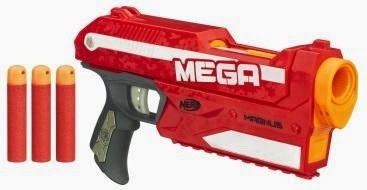 But is it bad I was most excited about the NERF N-STRIKE MEGA MAGNUS Blaster? This one-handed blaster can be quickly reloaded so your "target" (i.e. : Hubby) will have to stay on (his) toes to dodge the whistler darts. HELLO. This thing shoots foam darts up to 85 feet. WATCH OUT HUBBY. Who is ready to play? Which toys are YOU most excited about?? Disclosure: I received samples of some the products mentioned in this post for free to facilitate this post. I was not otherwise compensated. All opinions are mine. I really do just love toys.